We can’t deny the awesome feeling that comes with exploring outdoor activities such as hiking, skiing, camping and other adventure sports. Many people get bored with their normal routine lifestyle hence they find peace when they go out and have a little fun with their families and friends. 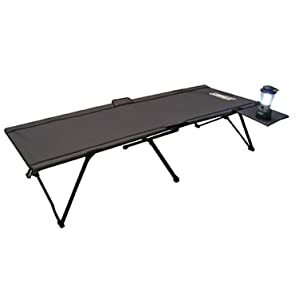 Camping can be more enjoyable if you have the best camping cot for traveling outdoors. The TETON Sports Outfitter XXL Cot offers an awesome sleeping comfort that can assure one of a sound sleep every night. When paired with the TETON Sports Outfitter Camp Pad, the duo presents a great combination that is comfortable enough to use as a guest bed. The cot is portable because it folds into a sturdy drawstring bag for moving or carrying around. It has better protection for tent floor, thanks to the specially designed rubber feet. The cot is relatively strong and stable given that it can support up to 600 pounds without sagging. As a matter of fact, its sleeping area is bigger than a twin size mattress. 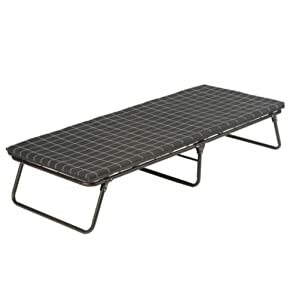 The Outfitter XXL Camping Cot is perfect for outdoor activities such as Hunting and Base Camp. The cot is easy to assemble because you only need to pull it out of the bag, unfold it and snap the two end rails in place. You can consider purchasing a good bed roll and place it on the cot to make it more comfortable. Kamp-Rite Oversize Tent Cont offers easy assembly and set up. The oversize jungle gear only weighs 25 pounds and folds to 32x36x6. You can be assured of sleeping comfortably away from the ground, where you could get exposed to dangerous creatures like snakes and bugs. It has a sturdy aluminum frame that can support a lot of weight without bulging. If you are planning to go out for any camper or car camping, then this sleeping cot would be ideal for you. Another great aspect to consider about this cot is that it comes with a 3/8 inch foam insulating pad. You don’t have to freak out about bad weather because this sleeping cot can handle any type of weather, thanks to its 210D tent top and tape sealed rain fly. The Kamp-Rite Oversize Tent Cot is one of the best cots because it offers you the chance to sleep on a cot inside a roomy tent. The Coleman Comfortsmart Deluxe Cot offers you the absolute comfort that you deserve whenever you go out camping. Just as its name suggests, you will enjoy comfortable rest for a great day exploring the outdoors. The cot is portable and can be easily carried around and set up within a few minutes. The cot folds up compactly and it fits well inside most car trunks, hence it comes in handy when one is ready to pack up. You can be assured of getting a great place to sleep, thanks to the cot’s strong steel frame. In fact, you will feel like you are sleeping in a bed when you add a thick foam mattress pad to the Comfortsmart coil suspension system. The Coleman ComfortSmart Deluxe Cot is specially designed to keep you comfortable and safe while you enjoy your outdoor activities. The Coleman Airbed Cot offers you the chance to experience the comfort of an indoor bed whenever you go to explore outdoors. The cot folds up into a carry bag for easy storage and transportation. 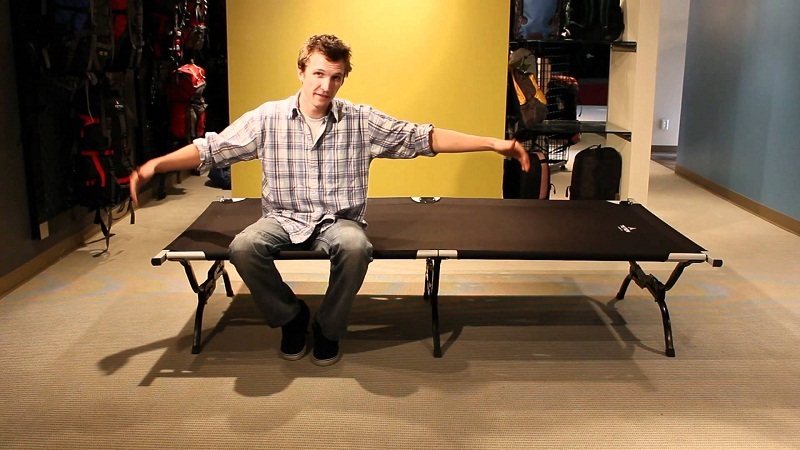 You can easily deflate the bed to give you an easy time when you are ready to pack up. 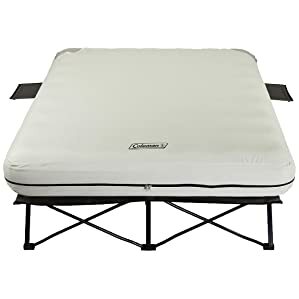 The strong steel frame holds the sewn-in cover that keeps the airbed in place. This sleeping cot is more than a cot because it comes with extra features including two side tables with cup holders, where you can easily place your personal items, a magazine, keys, phone or even your drink. You can be assured of all-night support, thanks to the ComfortStrong coil system. The cot has been factory-tested to be leak-free because the AirTight system will keep it there once you find the perfect firmness. Experience an easy, leak-free inflation by simply connecting the included 4D pump to the Double Lock valve. The Byer of Maine Portable Folding Cot is easy to store and set up. 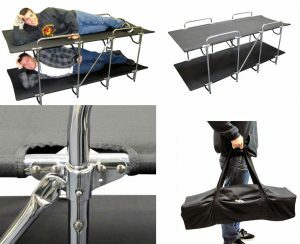 It’s an awesome sleeping cot that can be used for home, travel or camping use. Apart from being portable, the cot is incredibly durable and sturdy. The cot has been constructed from multiple fabric reinforcements, 600 denier polyester, and welded steel legs. The cot can be set up in less than a minute because it doesn’t have any loose parts. The full-sized camping cot is easy to use because setting it up is as simple as it name suggests. You only need to remove the sleeping cot out of its bag and set it up for a comfortable sleep. The Kamp-Rite Oversize Kwik Cot has been specially designed to favor those who like relaxing and enjoying a cool mode. The cot comes with a durable carry bag for easy transportation and storage. It also features side storage pockets that are ideal for keeping personal items. 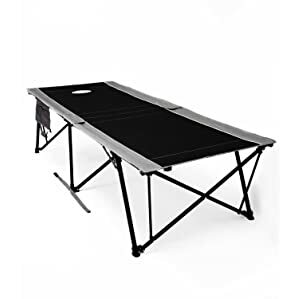 It has a heavy-duty frame that can accommodate up to 400 pounds and provides sturdy back support. In addition, the sleeping cot comes in a compact design for easy storage. It boasts a convenient structure that is comfortable and roomy. The Coleman ComfortSmart Cot offers comfortable rest that will make you enjoy your day exploring outdoors. The cot fits inside most car trunks because it folds up compactly making things easy when you are ready to pack up. You can be assured of getting a great place to sleep because this cot features a strong steel frame. You will feel like you are sleeping in a bed, thanks to the thick foam mattress pad and the Comfortsmart coil suspension system. The Coleman Pack Away Cot comes with a portable storage bag and has a weigh rating of 300 LB. The sleeping cot can accommodate a person up to 6’ 1” tall given that the Frame Style and Single Size Cot Expands to 72” x 33” x 24”. It is specially constructed using strong durable steel frames that offer maximum support. It also comes with a convenient folding table with cup holder for glasses, lantern, or even books. The Twin Packaway Cot is suitable for camping use since it is easy to set up and has a carry bag for portability. Camping cots are designed by different brands hence they come in varied structures that offer you multiple designs to choose from. You should invest in a suitable camping cot that perfectly meets your camping needs. You can get a comfortable sleeping cot from one of the stores around your neighborhood or you can opt to purchase it online and get it delivered to your home. Camping cot offers a great feeling and it gives you the opportunity to enjoy utmost comfort just the way you would enjoy relaxing at home. 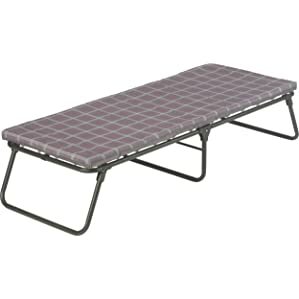 Cots for camping are designed to make you feel comfortable while sleeping outdoors. It’s very important to give yourself a comfortable and safe place to sleep at night while camping. You definitely wouldn’t wish to sleep in a place where you keep on turning and tossing all night. When you get a nice place to rest, then you can be assured of starting your day with a fresh feeling ready to explore the adventure. Nothing feels more comfortable and rewarding than investing in a suitable cot that gives you the pleasure to enjoy your sleep while camping. Camping cots are the most preferred choice for minimalist backpackers and campers because it takes less space and can fit in a small tent. They can easily collapse into a small space because they cover less floor space. 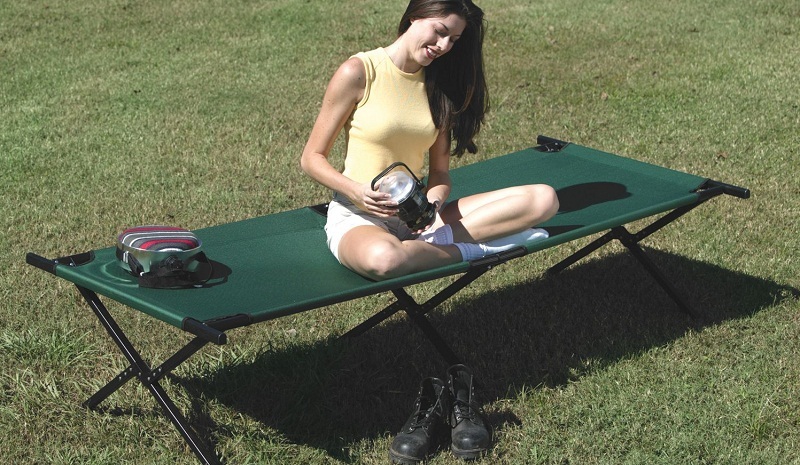 When space is the concern, then cots for camping can come in handy to save the situation. Other sleeping gears such as inflated mattresses can consume a lot of space depending on their sizes. Most campers consider space and that’s where cots for camping play a big role because they perfectly fit the campers’ needs. In addition, some camping cots come with extra storage space where you can store your gadgets, keys, flashlight or even hiking boots. Most cots are designed to last longer given the fact that they are used in harsh terrains like rocky surfaces. The materials used to make them are of high quality and they include sturdy nylon or canvas surface and built-in steel or aluminum frames. Camping cots can last for many years if they are properly cared for and used accordingly. If not taken good care of, the exterior of the bed can get damaged and made susceptible to air leaks and failure. That often happens when the cot gets exposed to punctures, bad weather, and excess weight. Some of the camping cots come with carrying bags making it easy for you to carry around and store safely. You may be exposed to all sorts of dangers when you sleep on the ground using mattresses and camping pads. As a camper, you don’t want to wake up and find dangerous animals and creatures such as tiny insects, pests or wild bugs crawling inside your bed. Regardless of the outside weather, you can easily enjoy a drier and warmer sleep using cots for camping. 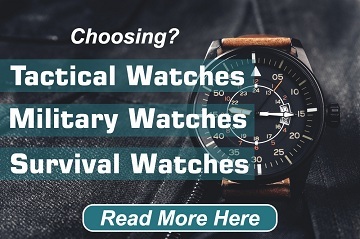 They also help you avoid discomfort since they keep your body safe from the cold ground. Sleeping on sticks, rocks and weeds can be very painful; hence you need to invest in a good sleeping cot. You can enjoy your camping trips by simply buying a portable sleeping cot that provides style, comfort, and convenience. It is true to say that these cots have evolved and moved on to fit into any camper’s backpack given the fact that they offer easy storage. 1. Some are expensive: Camping cots come in different prices and this is determined by the quality and size of the cot. Some campers get disappointed when they go to purchase these cots because some come at a relatively expensive price. One might be interested in purchasing a sleeping cot with excellent features but the price simply drives them away. 2. Some are hefty: Although most camping cots are light-weight, some are hefty and that makes it hard to carry them around. Backpacking will grow to be a great trouble for you if you purchase a hefty camping cot. On the other hand, camping can be more pleasant if you have a light-weight sleeping cot. Buying a camping cot can sometimes be challenging if you don’t know how to go about it. 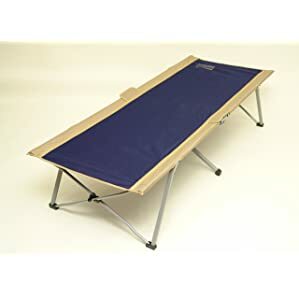 Cots for camping can be useful for various outdoor activities, including supported bike trips, canoe camping, skiing, hiking or even car camping. 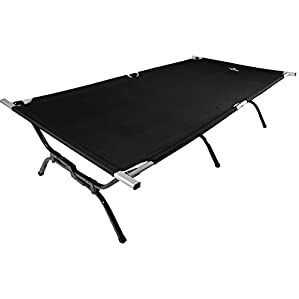 Sleeping cots are also awesome for long term camping situations like research trips and base camps where it’s worth it to pack in extra bulk and weight for great comfort. Portability, weight, and comfort are the most important factors to consider when you are planning to purchase a cot for camping. Extra sturdy or oversized camping cots come at a premium price. On the other hand, portable and very light cots can be very costly. You will be amazed to find out that the most comfortable cots tend to be a little bit heavy and can be hard to carry around for long distance. A good camping cot should be easy to assemble and dismantle. After finding a suitable camping site, the next step will entail setting up your cot. Hence, it is important to invest in a cot that offers ease of assembly. You can consider going for cots that are very straightforward with simple designs that let them unfold along joints and snap into place. You can check out this YouTube video on how to set up a cot. 1. Vacation Trips – Camping cots can come in handy for vacation trips since going for a vacation simply means staying in a cabin or hotel. A cot is easy to transport hence you will find it very important in case you stop to spend your night out on a vacation. 2. Overnight Guests – You can decide to invest in a good camping cot that will save your overnight guests with a comfortable place to sleep in. Cots offer comfortable sleep and you can choose to place one in a dedicated guest room. 3. Kids’ Parties – You don’t have to worry about where your kids will sleep anymore. Sleeping cots can save you a lot if you host overnight sleepover events or slumber parties for the kids. They can provide the kids with a great place to sleep. You should carry along a heavier cot plus extra padding that will offer you maximum comfort in case you are planning to go out on an adventure tour. Investing on the best camping cot is a great idea especially if you are planning to stay long on your vacation. You can be assured of enjoying the outdoor activities thoroughly when you have the right sleeping gear for your camping activities. 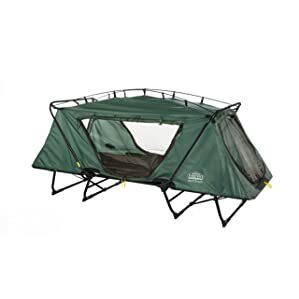 In our view, the Kamp-Rite Oversize Tent Cot emerged as the best camping cot for any outdoor activity because it comes with unique and top quality features as compared to the other cots. Unlike other cots, it can withstand all kinds of weather due to its 210D tent top and tape sealed rain fly. Great article. Very informative. Beginner camping enthusiasts should find this information very helpful. Lastly, investigate what models of camping cots are available out there. Make sure to meticulously find out everything about the cots that caught your eye: their features, disadvantages, user opinions. If you follow these steps, the absolute best model won’t take too long to reveal itself.